Daily Bread Food Bank Volunteer Day! The End to End Networks Inc. team volunteers!! 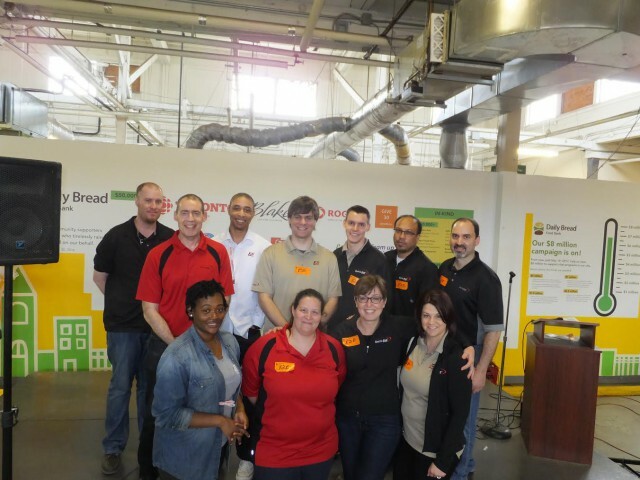 On Wednesday, April 26th, various members of End to End Networks Inc. volunteered an afternoon at the Daily Bread Food Bank in Toronto. This was the second year in a row that the E2E team has dedicated extra time to volunteering and supporting the Daily Bread Food Bank. It was an extremely rewarding afternoon. In total, the E2E team sorted over 3000 pounds of food, enough to help 153 families. In the two years volunteering at the Daily Bread Food Bank, the E2E team has sorted out over 9500 pounds of food; helping close to 500 families. A big thank you to Jennifer Cascao, our Client Services Specialist at End to End Networks Inc. for organizing the whole day. Besides being an established provider of Managed Network and Security Services across North America for close to 25 years, End to End Networks loves to help and give back the community. We encourage our clients and business partners to set time out of their busy schedules with their employees, to help the Daily Bread Food Bank in their fight against hunger in the Greater Toronto Area. It’s not only a great way to give back to our community; it makes you also appreciate the things that we take for granted! For more information on volunteer opportunities at the Daily Bread Food Bank, please click here for more information. If your company does a Volunteer Day at the Daily Bread Food bank, we would love to hear from you regarding your experience.